Our in-house eviction crews can remove your tenants quicker and more effectively than anyone else in the business. 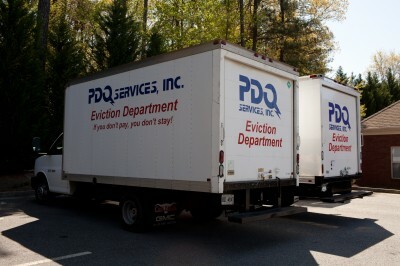 Our crews include only trained, insured PDQ Services employees who follow proper procedures in evicting tenants. Our crews arrive in a lettered truck that sends a clear message to other tenants who may be behind on rent. Our move-out service costs $99 per half hour for the first half hour and $85 for each additional half hour. There’s no charge for cancellations when you give a 24-hour notice. quicker you pay, the lower your fees!